We thank all authors for their submissions. 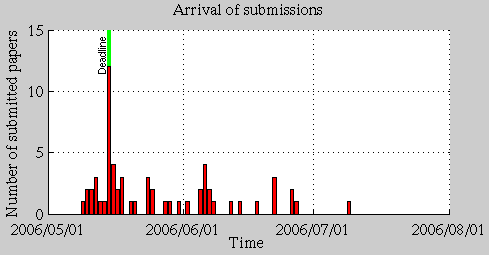 The growth phase of submissions before the deadline took approximately one week, and, according to our predictions, there was an obvious burst of activity on the deadline day. The system was, however, active for almost two months after the deadline. This resulted in a total of 61 submissions. The book is here! Your copy will be mailed to you shortly, please contact Eric (edonovan (at) ucalgary.ca) if you have any questions. 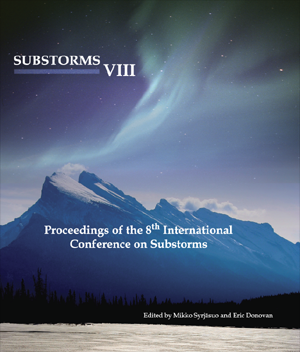 Antonova, E.E., "Onset of substorm expansion phase: theory predictions and results of experimental observations", in Proceedings of the Eighth International Conference on Substorms (ICS-8), edited by Syrjäsuo and Donovan, University of Calgary, Alberta, Canada, pp. 1-6, 2007.